Many people knew Palmer better than I did. But I knew him. We worked together on a biography of his life a quarter-century ago. It was a nice relationship that became part of my own ongoing life journey. A year later, he asked me collaborate with him again; this time on an essay to commemorate the 100th anniversary of the United States Golf Association. Arnold was politically conservative. He was also widely regarded as a symbol of decency and The Quintessential American. Meanwhile, Trump’s fondness for golf is well known. 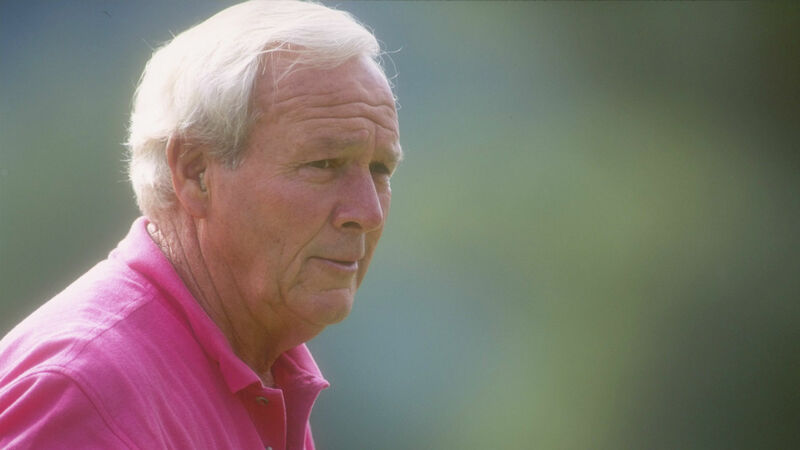 He crossed paths with Palmer on multiple occasions, and they co-hosted the opening of the Arnold Palmer Villa at the Trump National Doral Miami golf resort in 2015. I asked myself recently: What would Arnold Palmer think of Donald Trump today? There was a time when playing golf with Palmer was as much a part of being president as inviting Billy Graham to the White House. The first president Arnold met was Dwight Eisenhower, who later became a family friend. They were introduced at the Laurel Valley Country Club in Ligonier, Pa., five months after Palmer’s breakthrough triumph at the 1958 Masters in Augusta. Arnold was so quiet and unpretentious that Eisenhower didn’t know who he was. Because of the general confusion the other day, I failed to realize when Ben Fairless [Chairman of the Board of U.S. Steel] introduced us that you were the Arnold Palmer of 1958 Masters fame. I hope you will forgive my lack of reaction and accept, even this belatedly, my warm congratulations on your splendid victory. Ben suggests that some time we might have an opportunity to play at Augusta. This I should very much like though, judging from the brand of golf I have recently been displaying, I would be more than embarrassed. In later years, one of Palmer’s most prized possessions was a painting given to him at a surprise birthday party in 1966 by the artist, Dwight Eisenhower. It’s a pastoral scene that graced the living room in the Palmer home in Latrobe, Pa., for years. Palmer was comfortable in that political environment. While writing “Arnold Palmer: A Personal Journey,” I spent time with Arnold in Latrobe and at the Bay Hill Club & Lodge in Orlando, Fla., where he maintained a winter home. Each morning, we’d sit in his office. I’d turn on my tape recorder and we’d talk. Then Arnold would have a bowl of soup and go out to play 18 holes of golf. I’m not a golfer, but I’d walk the course with him. One morning at Bay Hill, I asked Palmer to critique the golf game of each president he’d played with. Palmer also called Ford “more of an Ohio State guy.” Ford, of course, had attended college at Michigan, but it wasn’t hard to figure out what Arnold meant. His arch-rival, Jack Nicklaus, had gone to Ohio State. The critique of presidential golf games continued. Then Arnold had a bowl of soup and went out to play golf. I walked with him. Palmer was 63 years old at the time. He played brilliantly that day. Through 12 holes, he was 4 strokes under par on the course where the Bay Hill Invitational (now known as the Arnold Palmer Invitational) would be played the following week. Arnold’s drive off the 13th tee split the fairway. Then, as we walked 200 yards toward his ball, I asked about the man who’d been elected president of the United States one month earlier. Arnold was getting madder and madder. Then he hit his next shot into the pond that fronted the 13th green. Arnold turned toward me with a look that was a combination of grimace, glare, and forced smile. “Why did I lose my concentration like that?” he asked rhetorically. Then he took a penalty drop and wound up with a double-bogey 6. Later, he rallied to finish the round with a 4-under-par 68. So … That brings us to Palmer and Donald Trump. It would presumptuous for me to speculate regarding what Palmer would think about the man who currently occupies the White House. So I asked someone who knew Arnold as well as anyone still alive: his older daughter, Peg, who was born in the mid-1950s before her father rose to prominence. Thomas Hauser can be reached by email at [email protected] His next book – “Protect Yourself at All Times” – will be published by the University of Arkansas Press. In 2004, the Boxing Writers Association of America honored Hauser with the Nat Fleischer Award for career excellence in boxing journalism.